Home » How To's » Getting Into Gas Powered Models For The First Time? If you’re like most of the new generation of RC pilots, you probably got your start with electric powered models propelled by torque monster brushless power plants fed by LiPo cells. That’s definitely not a bad thing, but if you’ve got a hankering for more realism, gas is the way to go. 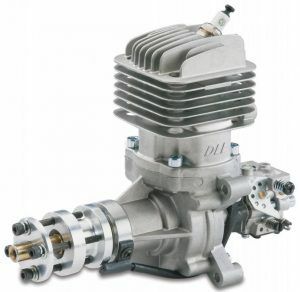 The look, sound and smell of a two stroke gas engine is sure to satisfy that “Scale” need you’ve been hunting for, but how do you go about getting into it without destroying your engine and plane or harming yourself from a prop strike? Of course, the best thing to do is consult with members of your local club who are familiar with gas powered models, but that might not be an option for everyone (or you might just be to proud or stubborn to ask). If you’ve got questions regarding getting into gas, our friends over at Hobbico have the answers you seek, using their DLE engine as a test bed and featuring on their Keep It RC website. Follow THIS LINK for all the info you need on how to get that beast burbling and feeding you the power you need whether you’re flying a scale Cub, a perfectly detailed Warbird or an extreme 3D machine. You’ve got questions, Keep It RC has answers. As always, use extreme caution when starting a gas powered model. There is absolutely no shame in using a chicken stick or other such device to prime and start your engine and beyond that, you’re going to have to tune the gas breather after break-in or for optimum performance depending on what you’re doing. Keep it fun, but more importantly, keep it safe and Keep It RC! Next What’s Your Favorite Model To Fly?